Master Airbrush Model B22 Airbrushing System with Model C16-B Black Portable Mini Airbrush Air Compressor. Airbrush Model B22 Airbrush Set. 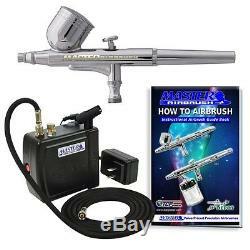 Multi-Purpose Precision Dual-Action Gravity Feed Airbrush with a 0.3 mm Needle/Nozzle and a 1/3 oz. 6 Foot Braided Airbrush Air Hose. (Comes with C16-B Air Compressor). Vogue Mini Air Compressor Model C16 Black. High Performance Mini 12V DC Airbrush Compressor with direct plug in 110V AC Adapter. Compressor provides "Air-On-Demand" It automatically shuts off when not is use. Air Pressure: Maximum 25 PSI; Auto Stop at 25 PSI; Auto Start at 15 PSI. Portable: Compact and Light-Weight; Weighs less than 2 lbs. And is Easy to Carry. Suitable for: Hobbies, Crafts, Nail Art, Auto Graphics, Temporary Tattoos, Tanning, Cake Decorating, Etc.. Supports Airbrushing for Most: Airbrush Types, Applications, Paint and Color Media, Levels of Users from Beginner to Advanced Artists. Details on individual items that come with this system below. Black Mini Airbrush Air Compressor. A 6 Foot Braided Air Hose with 1/8 Ends. Mini 12V DC Airbrush Compressor with direct plug in 110V AC Adapter. Compact and Light-Weight; Weighs less than 2 lbs. Maximum 25 PSI; Auto Stop at 25 PSI; Auto Start at 15 PSI. Airflow Control Knob: Adjustable Air Pressure. Automatically turns itself off if the unit becomes over heated. So you can be assured of Quality and Reliability. Compressor Supports Most Airbrushing Applications and M.
Cake Decorating, Temporary Tattoos, Tanning, Nail Art, Cosmetics, Auto Graphics, Hobby-Craft Paint! Type: 12V DC with AC Adaptor. Voltage: 110-120V/60HZ, 1.6 A.
Dimensions: 2" H x 4.25" W x 4.25. Weight: 1.6 LBS (0.8KG). Auto Stop at 25 PSI. Auto Start at 15 PSI. Air Hose: 6' Braided Air Hose 1/8'' BSP Ends. We are an authorized dealer for all the product lines we sell. If a listing is for a particular item then that is what you will receive. If you do want to attempt to change an order or make an address change, it is best to call our customer service department immediately. Once you pay your order prints in our warehouse for fulfillment. If you have questions on how to do this, please message us first. INTERNATIONAL ORDERING: All of our electronic items are rated for US voltage 110V. It is the customer's responsibility for knowing the correct voltage requirement of their country. If you select this option at checkout, be advised that if package is lost, stolen, or damaged, no claims can be filed. We do not mark packages as GIFT. We reserve the right to select best option. UPS cannot deliver to P. UPS Ground is used within the lower 48 US States and Canada. We will always make your order right. When contacting us please provide full UPC barcode number and/or Model Number off the wrong item you received to speed up the re-order process. NO reorders will be processed without following our policy information proccedure. Defective claims can only be made up to 30 days after receipt of your order. Then send your item back to us with a copy of the original order. SPECIFIC ITEM EXCEPTIONS: PAINT & DVD's - If defective or damaged they will only be replaced. We must have picture documentation of damage emailed to us on all paint related items in order to authorize a replacement order or return authorization. This listing is currently undergoing maintenance, we apologise for any inconvenience caused. Sellers: Get your own map today. The item "NEW AIRBRUSH KIT COMPRESSOR NAIL ART TATTOO DUAL ACTION SPRAY AIR BRUSH GUN SET" is in sale since Tuesday, September 17, 2013.